No to US Bases, Intervention and Plunder! The International League of Peoples’ Struggle calls attention to the strategic scheme and maneuvers of US imperialism to strengthen US military bases and escalate US military intervention and plunder in the Asian-Pacific region and calls on all the oppressed peoples in the region to fight US imperialism in every way possible and necessary. The US imperialist agenda has been highlighted by US pronouncements an actuations in multilateral meetings and side meetings and in country visits by US top officials. The multilateral meetings include the annual Asia-Pacific Economic Cooperation (APEC) Leaders’ Summit in Bali, Indonesia, the 8th East Asia and 23rd ASEAN summits in Brunei and negotiations on the Trans-Pacific Partnership Agreement. The frenzied country visits by top US officials underscore the efforts of US imperialism to advance its economic, political and military interests in the region despite its domestic budgetary problems and its worsening troubles on a global scale. The US imperialist agenda pursues its “strategic pivot” to Asia, which involves not only the further deployment of military forces but a broad-spectrum offensive that includes, among other objectives, forging the Trans-Pacific Partnership Agreement, a mega-free trade agreement favorable to the US-led imperialist alliance, and consolidating its strategic alliances especially with ASEAN countries. Imperialist chieftain Barack Obama was originally scheduled for a Southeast Asian trip, which would have included the APEC Summit in Bali, the 8th East Asian Summit followed by a US-ASEAN meeting in Brunei, along with stops in Malaysia and the Philippines. He was forced to cancel his trip at the last minute because of the ongoing deadlock between Democrats and Republicans in Congress on how to deal with the US fiscal crisis. The deadlock on the budget has resulted in the shutdown of the Federal government and the forced leave of some 800,000 federal workers. It has arisen from the erosion of the US tax base by the tax cuts for the corporations and the wealthy, the decline of the real economy and massive unemployment. While military expenditures are ever rising, there is scrimping for social services and the Obamacare in particular. The US has long abused quantitative easing (printing of money without the corresponding support from civil production) to cover its budgetary and trade deficits. Now, the abuse has made the debt ceiling a crucial issue amidst conflicting demands of the Republicans and Democrats. In lieu of Obama, US Secretary of State John Kerry is now leading the US delegation and personally pushing the US imperialist agenda in the meetings and visits. Kerry, the chief agent of US foreign policy, has recently heightened his hawkish profile by acting in recent months as the lead warmonger in the US plan to attack Syria. Despite its fiscal crisis, which has resulted in partial shutdown of Federal government services, the US ironically continues to push for the massive deployment of troops and ships towards East Asia as a means to advance US economic, geopolitical, and military interests and to keep rival China in check. US imperialism apparently ignores the fiscal crisis and growing anti-war sentiments among the American people as it threatens bombing and war on Syria and undertakes military actions in Somalia and Libya. Since late 2011, the US has pursued its strategic pivot towards Asia, with the goal of deploying 60% of its naval forces to the region. The US is aggressively seeking or renewing basing opportunities, access agreements, mutual defense pacts, and bilateral and multilateral military exercises in the region. 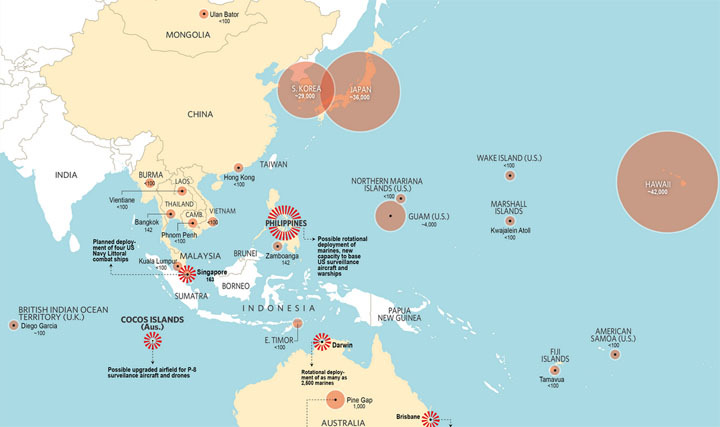 US treaty allies such as Japan, South Korea, the Philippines and Australia are being called on to host an increasing number of US troops and ships on a so-called “rotational” but effectively permanent basis. The US also wants its treaty allies to shoulder the increasing cost of hosting US military forces, imposing on host countries the burden of paying for bases construction and maintenance, accommodation of troops, environmental degradation, and other social costs. In South Korea, the US is preparing to use the military base being constructed by the Korean government in Jeju Island near China. Similarly, in the Philippines, it is expected to use a naval base now being constructed by the Philippine government in Oyster Bay near the disputed Spratly group of islands. In Australia, some 200 to 250 US troops are being rotated and are considered de facto based in Darwin Airbase. By 2014, the US expects to have 1,150 troops in Australia; the number is further expected to increase to 2,500 by 2016. Also in the Philippines, the US is negotiating a framework agreement that will allow increased rotational US troops, access to Philippine facilities, and prepositioning of weapons. The visit by Obama was seen as an incentive for the Philippines to fast-track the signing of the de facto basing agreement, despite repeated strong objections by constitutionalist and patriotic groups that the new arrangement violates a constitutional ban on foreign troops and weapons of mass destruction and expands the already questionable premises of the current US-Philippine Visiting Forces Agreement. The move to “rebalance” towards Asia is both to escalate US military intervention and to secure US economic interests as stated in Sustaining US Global Leadership, Priorities for 21st Century Defense, a Department of Defense strategic guidance document. The US seeks to dominate strategic sea lanes, control the source and flow of strategic resources, and force countries in this vast global region to accede to neoliberal economic dictates. On the sidelines of the APEC Summit, US negotiators were busy hammering out multilateral consensus on the Trans-Pacific Partnership Agreement (TPPA), which Obama wants to seal with 11 other countries by the end of the year. The proposed TPPA under the US baton would encompass 40 percent of the global economy and would include countries such as Australia, New Zealand, Japan, Singapore, Malaysia, Brunei, Vietnam, Chile, Canada, Mexico and Peru. The trade pact’s details have largely been kept secret from the public, but main provisions are expected to require member-countries to remove any remaining barriers to investments, to strictly enforce intellectual property laws that would raise pharmaceutical costs and stifle digital innovation and freedom of expression, and to allow private corporations to sue states before an international tribunal—thus in effect obliging member-countries to surrender big chunks of their national sovereignty to the imperialist masterminds of the TPPA. The current and persistent conditions of global depression have made the US more desperate in its efforts to rebalance towards Asia even as it desperately clutches to maintain control in other global regions. However, the Obama government is also bogged down by the crisis in its own backyard, as the still-unfolding impacts of the unresolved budgetary deadlock and shutdown have shown. The American people are also more vigilant and vocal than ever in opposing US military interventionist actions and increased spending for war while the people suffer the burden of the crisis. The people of the world demand an end to US imperialism and oppose its desperate efforts to dig its claws deeper into Asia-Pacific and other global regions. Countries want to assert their national sovereignty, with a wide range of patriotic forces calling to oust US bases and troops from their shores, and to resist the plunder of their resources and work force by transnational corporations. As elsewhere in the world, national and social liberation is the only alternative to the US imperialist agenda in the Asia-Pacific.